No surprise to us bully fans! Mac came into the shelter in very good condition. He hadn’t been tied to a chain, made to guard a junkyard, abused or otherwise neglected. He was given up by a sobbing owner no longer able to care for him. 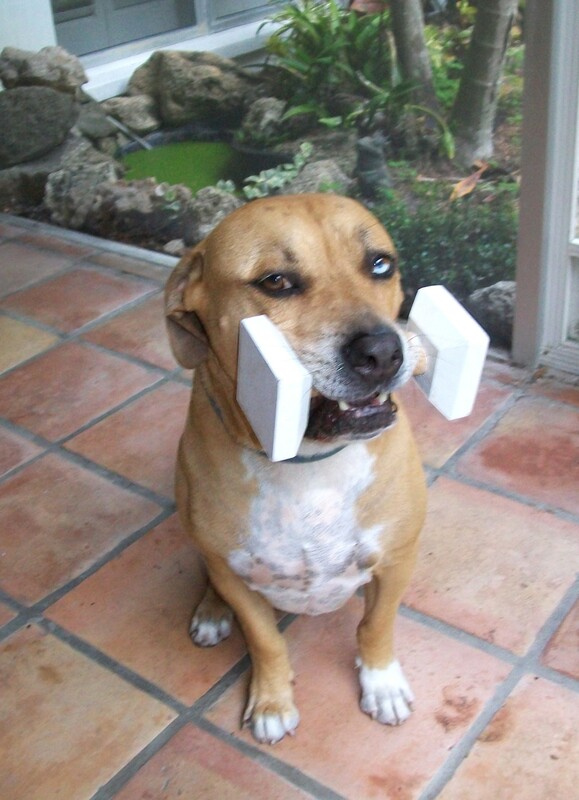 This was 2007, and I was looking for a racy, sleek, show-off type of dog to work in all kinds of training scenarios. Earlier that week, Michael Vick apologized for his ‘immature acts’ on national TV. These acts, as we know now, included clubbing dogs, drowning them, and hanging them from trees. I walked into the shelter with Vick’s speech still prickling the hairs on my arm and saw my new dog. No racy type he; instead he was low to the ground and built like a barrel with a head as thick and heavy as the ever-present anvil heaved over cliffs in Roadrunner cartoons. 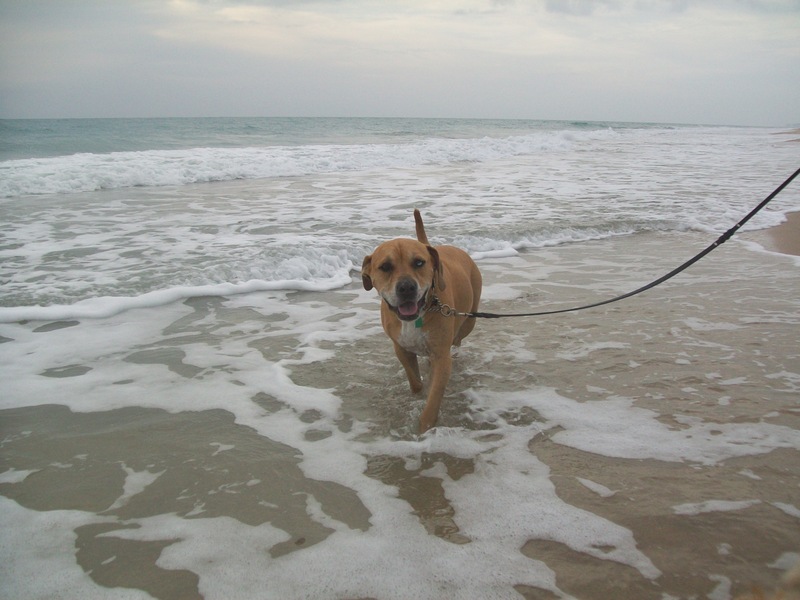 Mac was the type of dog short-sighted insurance companies like to exclude from policies. Mac showed real class from the first day. He was paraded up and down our street with neighbor children and their dogs. Parents who nearly gasped when they looked into his half-blue, half-brown eyes were soon petting him two-handed. The grin on the dog matched those on his admirers. Back in the house, I couldn’t find him for half an hour, until soft snoring finally alerted me to his location: our cream-colored sofa in the living room, head nestled and slack lips flopping over the arm cushion. I pointed him to his brand-new dog bed on the floor. The next seven years went by far too fast. 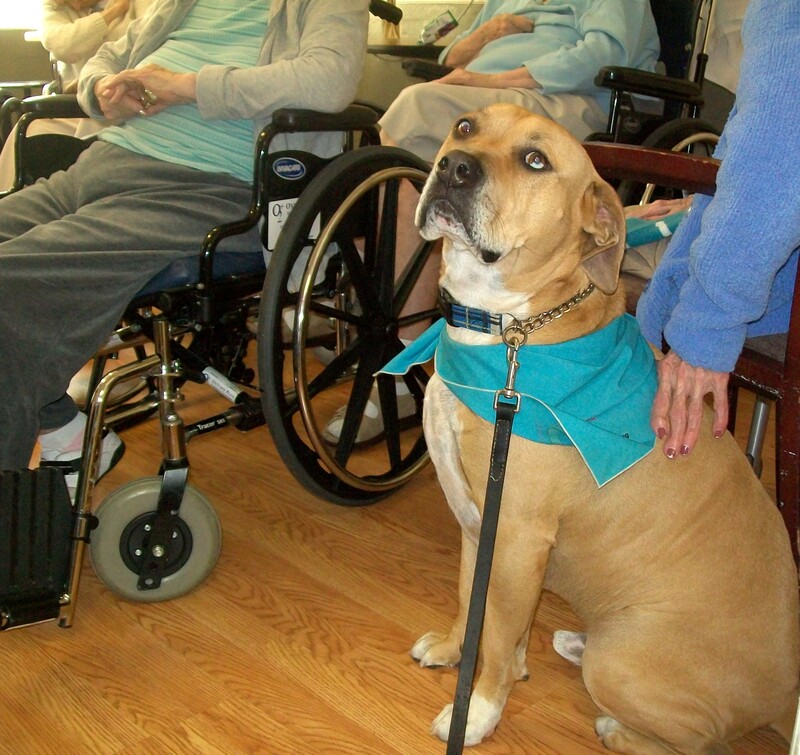 He became a certified Therapy Dog and loved his visits to nursing homes, where he plopped his big head into the laps of wheelchair-bound residents like the 104 year-old woman everyone called Grandma. She would light up and rub him vigorously with both hands, proclaiming, “He’s wearing me out!” Mac showed special calmness when out in public at our bank (thanks, Suntrust! ), in the post office, at Reading To Dogs events at the Boys and Girls Club, and on window shopping with me on Ocean Drive, where he was invited inside by shop owners unable to resist his masculine charm. We hiked in parks, lounged at the beach, and otherwise watched time pass. In May, I was very busy with training clients. I remember thinking I needed to spend more quality time with him as he aged. It looked as if he was slowing down just a little more than normal aging would indicate, but I still believed we had lots of time left. An ultrasound showed the bad news: a fast-growing cancer in his spleen, already showing signs of moving into other organs. Just three days before this diagnosis, he fairly flew around the yard, wind inflating his jowls and paws thundering after a ten-month old golden retriever female that caught his fancy. ( Mac liked them young, blonde, and pliant.) He had a weakness for young puppies, and they knew it. Their soft, squirming bodies and tiny teeth fastened onto his ears seemed to bring out the kindly grandfather in him. After play sessions the puppy-of-the-moment would often curl up with him on his soft bed. During his last week, we took him to the beach each morning and let him stay as long as he liked, digging at the waterline and standing chest-high gazing eastward as if a swim to Africa might be just the tonic he needed. He looked quite good except for a tiredness around the eyes. His lopsided smile was still there even when the vet came to the house so we could say good-bye in his favorite sunny spot on the porch. I think of him as robust and happy, and am thankful his illness was not lingering and painful. Sometimes the owners have to take that pain on, and that’s just what we did. Mac grins on his last day at the beach. Two nights after he was gone I had a dream in which Mac sped off unleashed down the street, ignoring my “No, No!” and “Come!” commands, just as he did when I first acquired him seven years previous. In the dream, he finally turned and trotted back triumphantly. I said, “jump up” and he sprang up on a large stool next to me. I kissed the top of his head, where the muscle gave him a sort-of cleavage, and smelled his wonderful, wafting hound-ness and felt the specific coarseness of his coat. I woke smiling. Dogs have their own personalities (dogonalities? 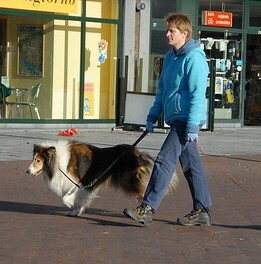 ), likes and dislikes, but as their owners and constant companions, we have great influence over them. Sometimes the behavior we think is cute is actually disfunctional. A potential client called me while I was making dinner to report that her dog of three years had bitten her son on the hand, and her son thought the dog had been aiming for his face. No one saw this except the son (13 years old) and the daughter (11 years old). She then asked me what would cause something like this. If I knew that just from her description, I would never need to leave the house. I begin with the appetizer. Q. How long had she had the dog? A. Well, I wasn’t there, but my son said he and his sister were sitting on the sofa and the dog walked up. His sister started petting the dog and my son reached over to pet him, too, and the dog lunged and bit him on the hand. At this point, I know there is more, but like a good detective I will extract the story slowly and with great patience as the rice I am boiling for dinner dries to an unpleasant-smelling lump. Q. Was the dog on the sofa? Q. Is he allowed on the sofa? Aha! This could be territorial in nature but I must delve further. Meanwhile, the rice is now inextricably linked to the pan, forever. Q. What about food and bones? Does he defend his bowl? Spidey senses tingling, I grip the phone tighter. I prompt her to go on. She does. Well, my son and my husband wrestle on the living room floor, very rough. We move the furniture so they can do it. My husband will pin my son and the dog circles them and barks. (Wait for it…) My husband will say, “Get the boy, get the boy” and the dog bites his ankles. Do your think that could be part of the problem? I picture my Sherlockian self turning slowly from the window wearing a smug look and raising my pipe to my lips. I don’t have to possess a doctorate in animal behavior to figure that one out. I tell her that wrestling must end today, never again, no mas. She suggests that if they wrestle the dog could be put in the yard. I emphatically tell her that the dog is not deaf and that father-son cage matches should occur in only one of two places. 1, At the local park, hopefully blocks away and well out of earshot of the dog, or 2, At the YMCA. She goes on to say that the dog has always been protective of her and her daughter,, and that the dog doesn’t want to be away from her and follows her from room to room. I am getting a good picture of a dog that doesn’t have a clear leader and has tried to take over, and will challenge the teenaged boy for dominance. This is not uncommon since that is the age boys get hormonal and start to become young men. It is clear, however, that the dog has been encouraged, even ordered, by the head of the household, no less, to ‘get the boy’. We all know that dogs retain traits and tendencies from their wolf ancestors, so imagine a wolf pack with an older Alpha male being challenged by a younger, adolescent wolf. The dog in this circumstance is almost certainly channeling his inner wolf while he tries to curry favor with the Alpha. I can picture the family laughing as the dog bites the boy’s ankles in a hit-and-run approach, which sounds to the dog like approval from other pack members. In this case, stopping the wrestling will not be enough. We make a plan to get together and I start to list all the adjustments they will need to make in order to change the dog’s behavior and reduce the stress the dog is feeling. Among these will be increased exercise in the form of leash walking, light training from the boy using a pocket full of tasty treats, and a no-paws-on-the-furniture rule. I am confident that these steps, if done consistently, will help dog and humans relax and enjoy each other on a functional level. Rice and pan are dead. I open the windows and suggest we order pizza. Watching the Westminster Kennel Club dog show every year brings out the stage mother in many of us. Our dogs are gorgeous, smart, and every bit the champions we see on the most famous dog show in the world, right? Let me recount my first showing experience way back in 1990. I had a lovely Rottweiler puppy named Maura. So convinced was I in her superiority that at the tender age of six months, I decided she was ready for her first show. 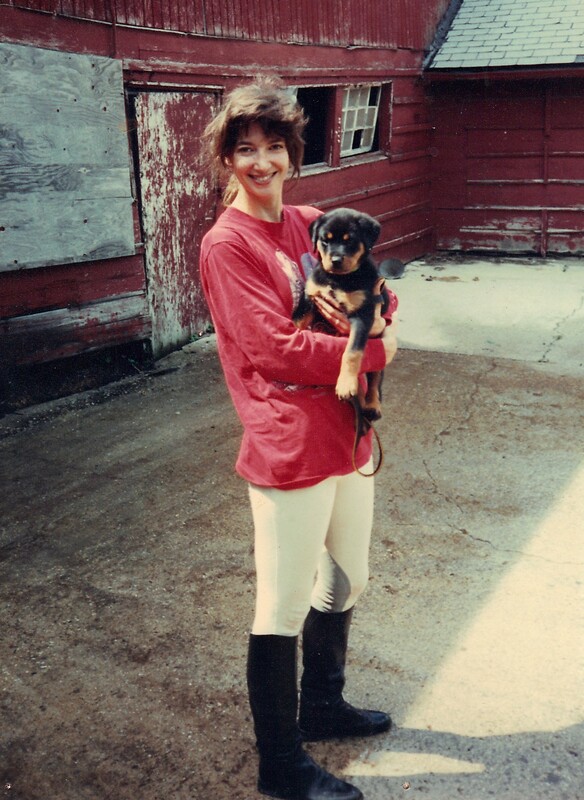 Since I was already a full-time dog trainer, I confidently entered her in puppy conformation and obedience. First: conformation. This is when the judge looked at my dog’s general appearance, including body style, eyes, ears, teeth and girlie parts. I had taught Maura to stand without me propping her up, and she stacked rather nicely, with back legs extended behind her and head held straight. I stood there with a loose leash, waiting for the accolades I was sure would be coming our way. All went well until the judge, a no-nonsense woman in a powder-blue pantsuit, cupped her hand under my puppy’s aforementioned girlie parts. My cute little Rottie let out something between a belch and a growl that only lasted a second, but I felt it resonate all the way up the leash. The judge paused, cocked her head and cupped between Maura’s back legs again. I actually coughed loudly to try and cover up any sound that may come from the puppy’s mouth. The judge looked balefully in my direction and moved on. OK, I thought, onto the obedience ring, where we’d really shine. Next: obedience: This was my wheelhouse. I had this. Maura was young, but I had lots of time to work with her and she knew her commands. She flew through the easy stuff: Sit, Come and Stay. Then came the off-leash Heel, where she was required to match my pace exactly, turn with me, and sit when I stopped. She did me proud until a full-on fight broke out five feet from us between two Briards. This is a breed that looks much like cousin It from the Addams family: we assume they have eyes but they are hidden behind lots of straight hair. Maura jumped out of the way, but in dog show land, this was no excuse for not staying in formation. I watch the handlers at Westminster and feel their pain. Dog showing is no walk in the park!